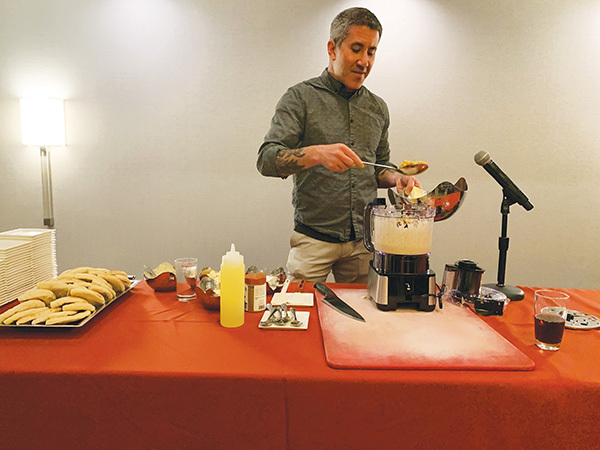 Just before the James Beard Award-winning chef Michael Solomonov demonstrated his five-minute hummus recipe, Maxine Schwartz, a jewelry designer from Westfield, presented a $32,000 check to Brian Eglash of Pittsburgh. Eglash is a member of the Tree of Life synagogue and senior vice president and chief development officer at the Jewish Federation of Greater Pittsburgh. The October mass shooting at the Pittsburgh synagogue permeated the March 28 program which raised more than $115,000 for Jewish Federation of Greater MetroWest New Jersey. Eglash delivered the keynote address to a crowd of over 400 at the Sheraton Parsippany Hotel, followed by a conversation between Solomonov, whose family belonged to Tree of Life, and Meny Vaknin, a local chef, a past champion of the Food Network television show “Chopped,” and owner of Montclair’s MishMish, Marcel Bakery & Kitchen, and the soon-to-be opened Luisa Bakery & Café. 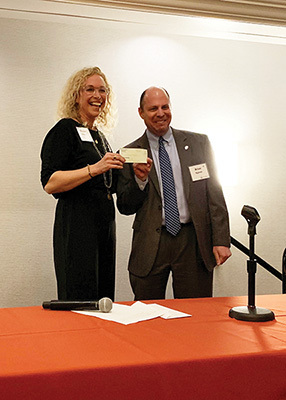 “I do believe that together we can do more than we can each do alone,” Schwartz told the crowd as she handed an actual check (as opposed to a blown-up version) to Eglash. Schwartz celebrated her son’s bar mitzvah at Temple Emanu-El in Westfield on the Shabbat morning of Oct. 27, the same day as the Pittsburgh attack. She and her husband felt “destroyed” because “it could so easily have been at Temple Emanu-El.” Rather than make a donation, she decided to put her talent to work, and gave 100 percent of the proceeds to the Pittsburgh federation from the sales of necklaces with a tree of life motif she had previously designed. In his remarks, Eglash highlighted the Pittsburgh federation’s impact in the aftermath of the mass shooting, and credited federation with saving lives by hosting an active-shooter drill at the Tree of Life synagogue weeks before the attack. Two life-saving measures that came out of that drill included the rabbi’s instruction to carry a cell phone on Shabbat and holidays that enabled congregants to call 911, and the opening of exit doors that had been blocked. “It literally saved lives,” Eglash said. To the tehina in the blender he added a little garlic, some lemon, salt, cumin, and water, all the while telling the audience tidbits about Israeli culture and tehina’ s role in Israeli food. “It’s the mother sauce,” he said. Solomonov peppered his remarks with humor and heartbreak. 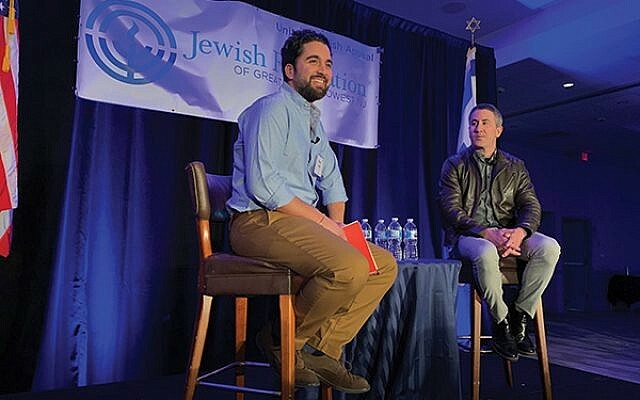 He shared his love for Israel, his inspiration for bringing the cuisine to Philadelphia in the form of Zahav, and his own ties to Pittsburgh — born in Israel, he spent a number of years in Pittsburgh where his mother taught at the local Solomon Schechter Day School and his family belonged to Tree of Life Synagogue. His family made aliyah when he was in high school. He also spoke about the death of his younger brother David, who was killed by sniper fire three days before he was to complete his Israeli army service. After just three semesters at the University of Vermont, Solomonov returned to Israel to look for work. “I got a job working at a bakery, not because I wanted to be a chef, or even a baker, but because three semesters in studio art or media doesn’t get you super far,” he said. When he decided to go to Israel after his brother died to cook for IDF soldiers, the non-Jewish chef he’d been working for in Philadelphia decided to join him. “‘We’ll roast a suckling pig, we’ll make osso bucco,’” Solomonov recalled the chef saying. “We made schnitzel,” he added, dryly, to peals of laughter from the crowd. But seeing the Israeli kids in the army offered a sharp contrast to their American peers, and something shifted. “In hindsight, maybe that’s what started it all,” he said. When he returned to the U.S., “I didn’t want to cook Italian food, and I didn’t want to cook French food,” he said. Solomonov and Vaknin together agreed that both of their cooking styles defy classic techniques. That’s because they cook using methods perfected in their grandmothers’ kitchens. “It contradicts all those old, white, male French chefs,” said Solomonov. They “aren’t the people that actually cook this food. It’s the grandmothers who don’t have to measure ingredients and literally have a dynasty, a cooking tradition that tells the story of where we come from post-second Temple period.